The former NBA star is keeping a stiff upper lip about the fact that he’s apparently getting no face time with good buddy Kim Jong-un during his visit to start training a basketball team in North Korea. But it’s got to be bothersome. Rodman went on at some length about how he and Kim are not, like, joined at the hip or anything. You know, he travels to North Korea for a whole bunch of different reasons, not just to visit with its despotic, murderous leader. 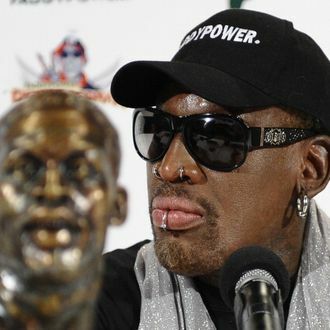 “I’m not just coming over here to meet the leader,” Rodman told the Associated Press. “I came over here to meet the basketball team, to prepare a great game for the leader for his birthday. And people need to understand that it’s not important for me to meet him every time I come over because he has another greater job to do for his country, and I respect that, but this trip was basically to come over to train the team, so we can have a great, great, game.” Yes, it’s important people know that. This leader Rodman speaks of sounds like one hell of a guy. But Rodman is right: Nobody likes clingy.